Beauty Sketch by Jacq: How much are you willing to spend on Make Up Wipes? How much are you willing to spend on Make Up Wipes? In fact, Clé de Peau Beauté Makeup Remover Towelette only charges $230 (about US$30) for a packet of 50 sheets, which is fairly low in CPB standards. I'd say the CPB is a bargain, compared to, say, MAC Wipes in HK. Wipes or cleansing cloths aren't commonly big among Asian brands, at least the department store lines. Indeed there are multiple drugstore lines that make cleansing wipes for convenience purpose (mainly). However, they are not marketed as beneficial to skin or jam-packed with good ingredients. 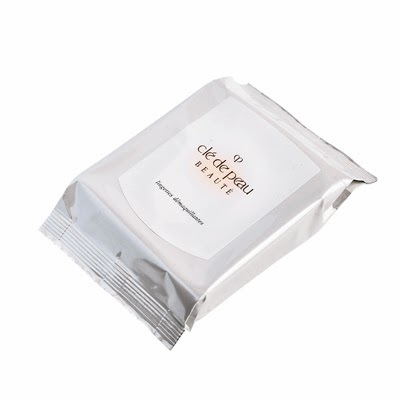 This CPB Towelette says it contains "Evening primrose oil, rice germ oil and grape seed oil" amongst other great constituents to effectively remove make up (like cleansing oil), and provide anti-aging, anti-oxidant effects. The size of each sheet is 150 mm x 75 mm, seems quite small and narrow to me. This week, several local beauty magazines published this launch and beauty editors reviewed this. Google results of review also returned positive, e.g. free trial review on she dot com. They mostly agree that the sheet is moist and eye-safe; it is effective and removes waterproof make up. I also learn that this towelette leans on the oily side, and a double cleanse is definitely required to take off the residue, which may be an issue to people who uses wipes when they want to skip all the fussy steps. It is also scented/fragranced. That being said, unless they come in a box or better seal/opening, I don't think I will shell out $230 for a pack of this. Or perhaps, if one day my skin care habits and needs totally change, I may consider this. I did a little research on other more expensive make up wipes (mainly on Sephora website), for UK high-end wipes, please refer to this lovely post by LipGlossiping. How much MAXIMUM are you ready to spend on make up wipes? I just bought drugstores brand, where I live are quite expensive, even the brands like nivea or neutrogena.